"Pete Rock is widely recognized as one of the greatest hip hop producers of all time. His name is oft included in the pantheon of the greatest, alongside DJ Premier, RZA and J Dilla. In addition, Pete has one of the world's most extensive vinyl collections, the sort of collection whose size can only be estimated --and that estimate stands in excess of 100,000 LPs. His production forte is the melding of Jazz with early 90s East Coast boom bap, regularly sampling classic soul greats like James Brown & Curtis Mayfield, jazz oddities like Tom Scott & Les McCann, and innumerable others. This production prowess is best demonstrated though his work with partner in rhyme CL Smooth. There was a time however, before Pete met CL. A time before the world came to know Pete Rock & CL Smooth. A time when Pete was a 19 year old in his basement in Mount Vernon, NY making beats with an SP-1200 drum machine, sampler, and sequencer. 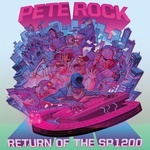 These previously unreleased beats are now compiled here in Return Of The SP1200, the debut release from Rock's own Tru Soul Records, and a tribute to his beloved sampler. Also features additional scratches from Beat Junkies member J. Rocc." RSD 2019 release. "Pete Rock is widely recognized as one of the greatest hip hop producers of all time. His name is oft included in the pantheon of the greatest, alongside DJ Premier, RZA and J Dilla. In addition, Pete has one of the world's most extensive vinyl collections, the sort of collection whose size can only be estimated -- and that estimate stands in excess of 100,000 LPs. 2019 will see the launch of Pete Rock's own imprint, Tru Soul Records. And being a lover of all things vinyl, he's decided that the label's inaugural release has to be for Record Store Day. Rock's production forte is the melding of Jazz with early 90s East Coast boom bap, as demonstrated though his work with partner in rhyme CL Smooth. But there was a time before Pete met CL, a time before the world came to know Pete Rock & CL Smooth, a time when Pete was a 19-year-old in his basement in Mount Vernon, NY making beats with his SP-1200. These are those beats. Released for the first time ever on Return Of The SP-1200 debuting on Record Store Day 2019."